Exhibited: Miho Museum, Shigaraki, Shiga, Japan, The Archaic Smile – From the Mediterranean to East Asia and Japan, 12 July – 19 August, 2007. The Minneapolis Institute of Arts, 16 January 1984- 23 April 1985. Thermoluminescence: Oxford Authentication, 6 February 1998, sample no. N198c25: date of last firing is estimated at between 3,000 and 5,000 years ago. 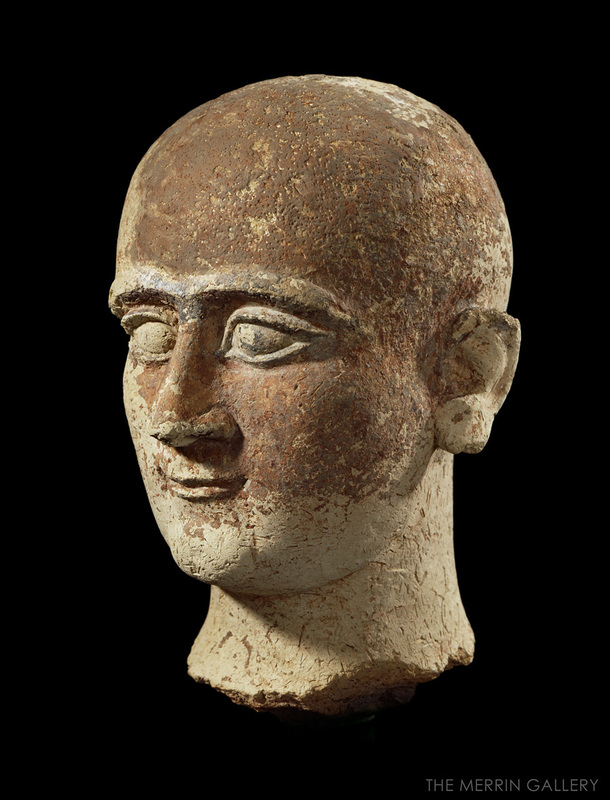 In addition to being one of the most soulful and beautiful early Mesopotamian heads in private hands, this head is also extremely rare. 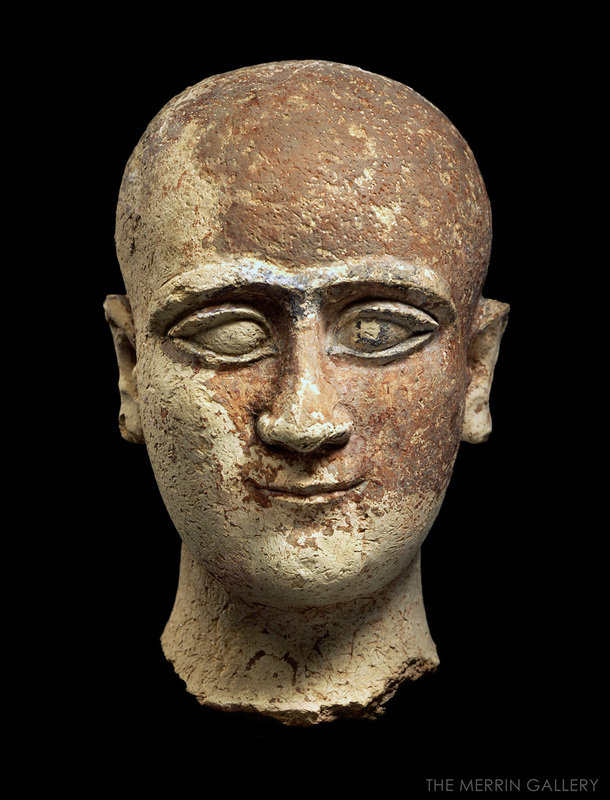 The head is thought to represent a priest or votary of the goddess of healing, Gula. 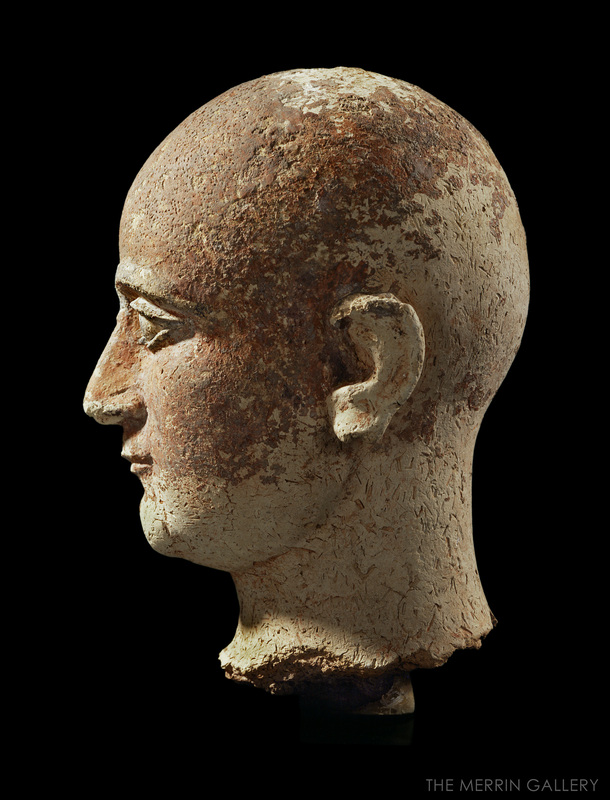 Similar heads and busts are represented in the collections of the Museum of Fine Arts, Boston and the former Schimmel Collection. Our subject has youthful features, a bald head, large staring eyes, and a prominent dimpled chin. Ample original polychrome survives; in addition to the red paint that was meant to convey skin tone, there is black paint on the eyebrows and (proper left) pupil. The effect would have been quite striking. Combining realism and stylization, this head displays realistically formed ears, a dimpled chin, fleshy cheeks, a strong nose, and a gentle smile. Mesopotamian temples were dedicated to specific deities. Although they must have contained images of the deities, none have been found. It is believed that inter-city wars resulted in rampant destruction – the victors destroying the temple and its gods as proof and insurance of their success. However many non-divine figures have been found. These represent donors or priests. Because access to the temples was very restrictive, worshipper-figures were created to be placed within the sanctuaries to serve as substitutes for the donors. In this way, the figures acted as ever-vigilant, ever-devoted stand-ins for their owners. They professed their adoration and at the same time hoped to received blessings and boons from the deity. The end of the third millennium BC was a period of tremendous upheaval in Mesopotamia. After the Akkadian dynasty collapsed, competing armies of Elamites and Arabian Amorites defeated the armies of Ur. When the Amorites wrested control, they initiated a revival of Sumerian culture, in an attempt to emulate the magnificence that had preceded them.